This Quiz is to test your English Vocabulary. This is English Brain Test for School going Teens. In this English Quiz test, you challenge is to write down as many words as possible in the English Language that has 6 letters, all in Alphabetical order. Do post your answers in the comment section. Lets see how many such English words you can write? 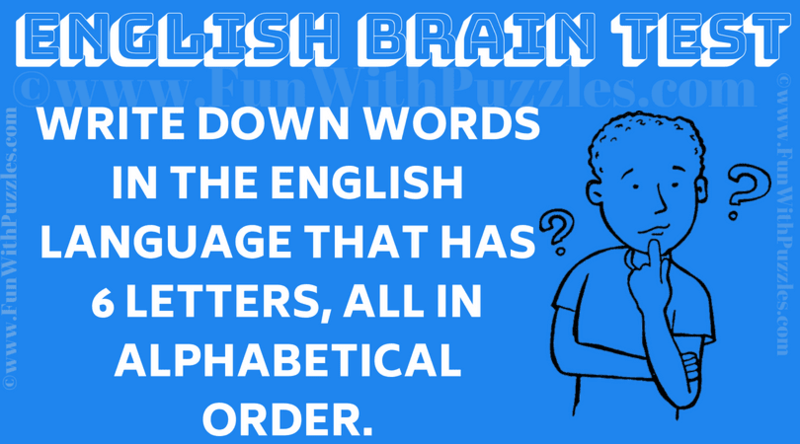 Can you solve this English Quiz Brain Teaser? Answer of this "Quiz to Test your Vocabulary", can be viewed by clicking on answer button. Please do give your best try before looking at the answer.